Fed up with all the Valentine’s Day drivel? Want to hear some twisted tales of love? Live near Faversham or Folkestone? Then come along to Twisted Love on Friday, February 16 at The Limes, Preston Street, or on Saturday, February 17 at the Eleto Chocolate Cafe, Folkestone, from 8pm to hear stories by Michele Sheldon, Mike Blakemore, Charlie Bain-Smith with a very special appearance from preying mantis duo Burgess and Norman. Tickets cost £5. For Faversham go to https://www.ticketsource.co.uk/event/FFELGF and for Folkestone go to https://www.ticketsource.co.uk/date/448629 . Cash bar only at Folkestone. Fearless folks of Faversham and Folkestone! Prepare to be scared by some spine-tingling stories and ghoulish (PoundUniverse) prizes this Halloween. We’ll once again be gathering around the fireplace in the opulent Drawing Room of Folkestone’s famous Grand Hotel to hear spooky tales written especially for Hand of Doom Productions on Friday, October 27 from 8pm. Drinks available from the bar. Then, on Saturday, October 28, we’ll be chilling The Faversham Society & Fleur de Lis Heritage Centre at 13 Preston Street, ME13 8NS Faversham, Kent from 8pm where you can bring your own bottle of something to steady your nerves. Come and listen to six stories and a song inspired by the UK’s largest public art festival. The fourth Folkestone Triennial, from September to November 5, sees 20 international artists creating site-specific public artworks across the town, relating to the theme of Double Edge. 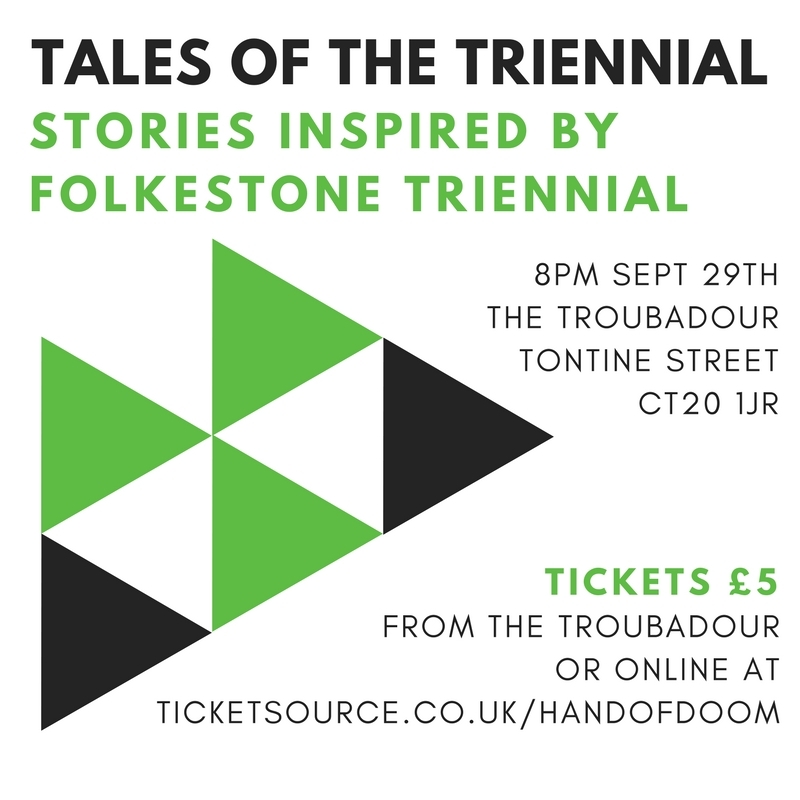 Tales of the Triennial takes place at The Troubadour of Kent pub in Tontine Street on Friday, September 29 from 8pm. Tickets cost £5 and are available online or from The Troubadour of Kent – Micropub. Hand of Doom calling Kent writers! We’re busy planning our next live storytelling event and we want more Kent writers to be part of it! We’re looking for a new short story or monologue that we can perform at our May event, taking place in both Faversham and Folkestone. 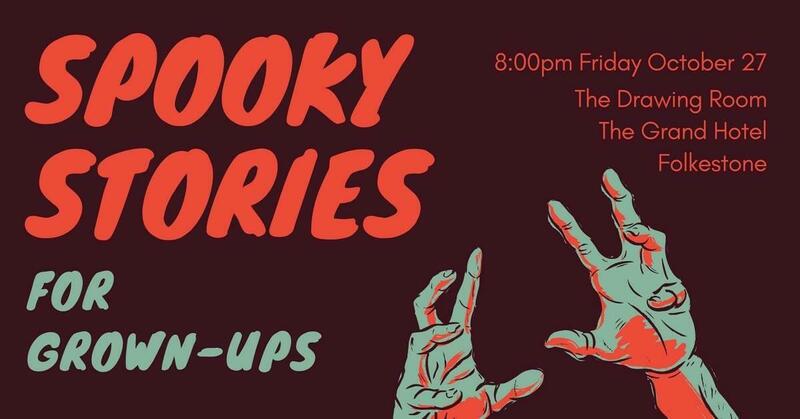 The winner will have their story or monologue read at both events and receive a cut of the profits (sadly never massive, but it’s still payment!). The winner will also get two free tickets for the venue of their choice (venues and dates to be confirmed shortly). You can read the full details and rules here.